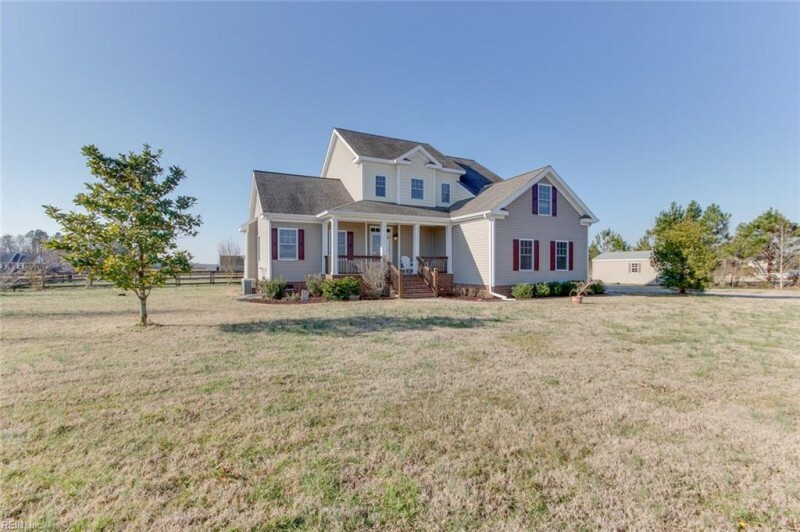 COME ENJOY THE GOOD LIFE IN THIS SPACIOUS 2,495 SQUARE FOOT SINGLE OWNER HOME THAT SITS ON 3.6 ACRES. THIS 11 YEAR YOUNG HOME HAS SO MUCH TO OFFER WITH UPGRADES AND RV HOOK UPS, PRE-WIRED FOR A PORTABLE OR PERMANANT GENERATOR. LOTS OF FENCED IN SPACE TO SEPERATE ANIMALS IF NEEDED ALONG WITH SEVERAL OUT BUILDINGS INCLUDING BUT LIMITED TO A 12X28 (336 SQUARE FOOT) FREE STANDING GARAGE/WORKSHOP AND A 36X36 (1,296 SQUARE FOOT) HORSE BARN WITH HAY STORAGE AND TACK ROOM WITH WATER AND ELECTRIC (COULD ALSO BE A WORKSHOP). LOCATED OUT NEAR TRIPLE R RANCH WITH SECLUSION AND PLENTY OF SPACE FOR PRIVACY AND QUIET TIME. *OWNERS PAID TO HAVE COX CABLE RAN TO THE PROPERTY FOR HIGH SPEED INTERNET. Ready to visit 2617 Ballahack? Request a free property tour! Send me more information about the listing at 2617 Ballahack, Chesapeake, VA 23322, MLS# 10239922. This 5 bedroom, 4 bathroom home located at 2617 Ballahack, Chesapeake, VA 23322 has approximately 2,492 square feet. It is currently listed for $465,000 and has a price per sqft of $18,660. This home is currently Sold under the MLS#: 10239922. This listing is provided by Creed Realty. 2617 Ballahack Road, Chesapeake was built in 2008. It has Garage Att 2 Car, Garage Det 1 Car, 4 Space, Driveway Spc parking.The kitchen includes Dishwasher, Disposal, Dryer Hookup, Microwave, Elec Range, Refrigerator, Washer Hookup. 2617 Ballahack is part of the Hickory neighborhood located in 23322.